Chinese LED TV manufacturer, Hisense, has announced to start its production and sales in Pakistan. Tri-Angels Electronics established its first assembly line while its “Clean Laboratory” is under process and will be completed in January 2019. Tri-Angels Electronics has made a 2.8 million investment to establish Hisense’s production and sales network. This was announced in a ceremony held at Karachi in a local hotel on August 8. Chief Executive Officer (CEO) of Tri-Angels Electronics, Imran Ghani, the Consular Attaché of China to Karachi, Miranda Lee and Qin Xuqian, were also present on the occasion. Talking to ProPakistani, Imran Ghani told that Hisense is a 39-year-old brand and from the past 14 years has been leading charts in China standing as the No. 1 brand in the country and No. 4th brand in the world. Tri-Angel Electronics is not only the exclusive distributing partners for Hisense brand but they have also established LED TV manufacturing plant in Karachi. "Tri-Angels electronics with this collaboration with Hisense will be leveraging its world-leading production and technology-development capabilities. Tri-Angels offers high-quality products and services based on highly advanced technologies that benefit people and companies alike. We will continue to focus on further improving our technical capabilities as a manufacturer of LED TV and on tackling fresh challenges towards advanced “New Eyes for Industry” that assure a sense of excitement and trust to our customers." Imran further said that to establish its first assembly line, Tri-Angels electronics invested $1.5 million. Another $1.3 million has been invested in “Clean Laboratory” project which is under process and will be completed in Jan 2019. With the “Clean Laboratory”, Pakistan will able to produce LED TV boards and almost 75 percent TV production will be transferred to Pakistan. Hisense currently has 3 overseas production bases, 7 overseas R&D Centers and 18 overseas companies and now with the partnership with Pakistani manufacturers, their network, production and sale would increase. On the question of market size, Imran said that the Pakistani TV market size is 1.4 million units per year. LED TV market is growing at a rate of 8 percent yearly. The local assembly is 1.2 million units and rest is imported. Chinese brands are overtaking Korean and Japanese brands. Currently, 60 percent of the TVs sold in Pakistan are Chinese. 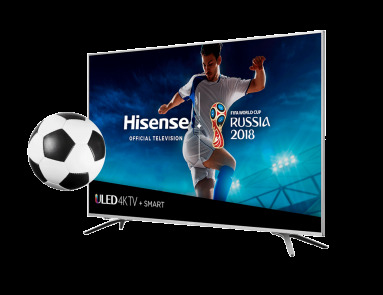 Hisense’s top products include Hisense 100 inch 4K Ultra HD Smart Laser TV with optimal brightness, Hisense U9 ULED TV, Hisense U7 ULED TV, and many more. Hisense has not only emerged as the top TV brand but it has also been manufacturing smartphones. Currently, the company’s available models in Pakistan include H11 Prime, H11 Prime Elite, and H12 Premium.